Any readers who have absolutely huge lawns or multiple properties may be interested in the many advantages and benefits offered by commercial lawn mowers. When it is time to cut the grass, and you have literally acres and acres to cover, the smaller residential models just do not cut it. This article covers many facts of commercial lawn mowers and also provides an overview of several of the better known models, made by high quality manufacturers, all available on the market today. Regardless of whether it proves to be a push lawn mower or a riding lawn mower model, numerous differences exist between commercial and residential lawn mowers. Durability is among the greatest of these, and this turns out to be significant for the consumer interested in his return on original investment. Enduring quality parts on a lawn mower range from the engine itself on down to the tires. These commercial lawn mowers typically are built of more costly parts which prove to be of higher quality and therefore last a good bit longer than residential lawn mower parts do. Another significant difference lies in the cutting decks. A good example of this characteristic is the John Deere Seven Iron II Deck. This is constructed from full seven gauge steel, which permits higher blade speeds and reduces clumping to a minimum. Various additional commercial brand models possess the similar kinds of decks which are both sturdy and capable of cutting down even the tallest grasses easily. Yet another critical difference between commercial and residential lawn mowers concerns the engines found in commercial mowers. Such engines are generally larger, more reliable engines which can be started up and utilized in a number of different jobs without demonstrating the slightest hint of any trouble. Commercial mowers should possess high quality engines, preferably with two cylinders, and with greater quantities of horsepower and better displacement, too. Various other parts, such as handles, tires, and controls are other significant difference areas which make the mowing task all the easier. Finally, warranty can be an issue of significant importance. 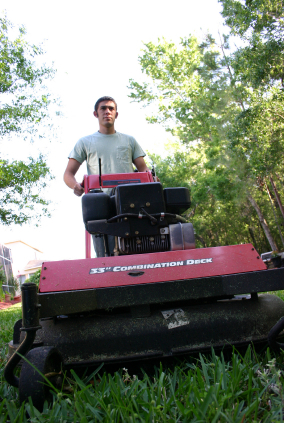 Commercial lawn mowers generally have warranties which are much similar to their residential cousins. For maintaining larger properties or facilities, or even for expert lawn care, commercial types of lawn mowers are more than just a terrific investment, they can be equipment that is a necessity. As an example, numerous companies which take care of lawns will require dependable equipment which is a real cut above residential lawn mowers, simply as a result of the greater frequency of utilization and the costs of investment involved. Because of these factors, it definitely makes sense to purchase a mower which will not just reduce the total amount of time necessary to mow a lawn, but also one which is enduring enough to offer a greater return on the upfront investment. In these respects, commercial grades of lawn mowers perform the best, because they prove to be of superior efficiency, are far more durable, and come full of great features necessary to make the mowing process both simpler and easier. There are a few makers of good commercial lawn mowers who embody quality in their manufacturing of products. Lawn care outfits, along with the maintenance crews of larger fields, all utilize such products. It would be wise for a home owner with an enormous lawn or multiple properties to take heed from their example. As stated previously, a range of commercial lawn mower makers who believe seriously in quality exist today. These companies include John Deere, Kubota, Honda, and EverRide. All of them offer a high quality commercial grade lawn mower with plenty of features to make the job at hand simpler and more effective. Below, an example of each company’s high quality commercial lawn mower products are given with a brief overview. Founded in 1837 and over one hundred and seventy years old, The John Deere Company, which is the world’s largest maker of agricultural equipment, has been making high quality tractors, and subsequently fine lawn mowers, for many decades. Their high quality commercial lawn mower considered here is the Max Z-Trak Mowers Series 777. This reliable lawn mower offers a twenty-seven horsepower, liquid cooled OHV Kawaski gasoline engine. It features speeds ranging up to eleven miles per hour, the Seven Iron II Deep Deck, a hydrostatic system, and a nice full two year limited warranty which is bumper to bumper. Kubota Corporation of Japan was founded in 1890 and has operations in one hundred and thirty different countries. As the first agricultural equipment company to be honored with Japan’s coveted Demming Award for Quality, they also make fine commercial grade lawn mowers. Their featured commercial grade lawn mower is the Kubota ZD331. It includes a diesel engine which is liquid cooled and provides powerful thirty-one horsepower, as well as riding speeds of as much as seventeen miles per hour, with a blade speed of eighteen thousand. Honda Corporation, also of Japan, has long been recognized as the engine leader, making commercial landscaping engines which are both quiet, dependable, and fuel efficient powered, as well. Their featured commercial grade walk behind lawn mower is the HRC216HXA. This model provides a Honda OHV engine, a twenty-one inch deck which has a steel bottom, and a hydrostatic transmission. This is great information which will make it easy for me to decide…commercial grade it is. I have two neighbors and one has a commercial and the other has a residential; I can tell just by the sound of the commercial grade that the HP is more and the cut is much better than the residential grade mower. Is the Home Depot “Beast, and Z-Beast” models any good? I would like to know if there’s still a lawn tractor that will handle commercial use without being a zero turn.